"These are soft and very tall pull-apart rolls with tender crusts." Dissolve 1 tablespoon sugar in warm water in a small bowl, and sprinkle the yeast over the water. The water should be no more than 100 degrees F (40 degrees C). Let stand for 5 minutes until the yeast softens and begins to form a creamy foam. In a bowl, mix together the potato flakes, whole wheat flour, and unbleached flour. In a large bowl, mix together the buttermilk, softened butter, 2 tablespoons of sugar, salt, and egg until the mixture is well combined. Pour the yeast mixture into the buttermilk mixture, and add the flour mixture by half cups, stirring until the ingredients form a soft dough. Turn the dough out onto a well-floured surface, and knead until smooth and elastic, about 3 minutes. Shape the dough into a ball, oil the surface with vegetable oil, cover, and let rise in a warm place until doubled, about 1 hour. Gently punch down the dough, and divide into 9 equal pieces. Shape the pieces into balls. Grease an 8x8-inch baking dish, and place the rolls into the dish so the rolls slightly touch each other. Brush the tops with melted butter. Cover the rolls with plastic wrap, and allow to rise in a warm place until doubled, 30 to 45 minutes. The rolls should rise above the top of the pan and be crowding each other. Preheat oven to 400 degrees F (200 degrees C). Bake the rolls in the preheated oven until golden brown, 25 to 30 minutes. Brush the tops of the hot rolls with another coating of melted butter, allow to cool slightly, turn the rolls out of the pan, and pull apart. Serve warm. The purpose of warming the buttermilk is to decrease the amount of time needed for the first rise. Buttermilk may curdle slightly when warmed; that's OK. Turned out to be lead rocks in the oven. 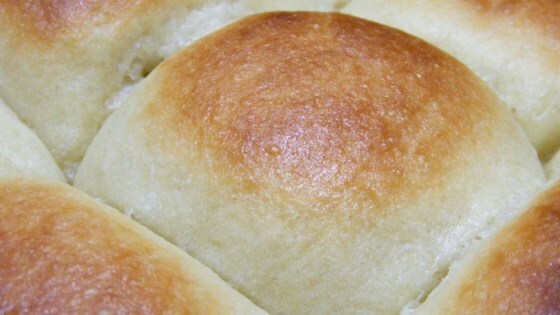 Delicious rolls! I followed directions except used oil (my flakes were butter flavored). I rolled them crescent roll style-no leftovers!